Willy Herrera, Drew Estate's master blender, greets fans on the showroom floor of the Big Smoke Las Vegas evening. The hallways of the Mirage Hotel and Casino in Las Vegas hummed with the voices of thousands of cigar fans last weekend, with aficionados pouring in from around the United States and as far as Australia and Greece to take part in one of the biggest cigar events in the world: The Big Smoke Las Vegas weekend. 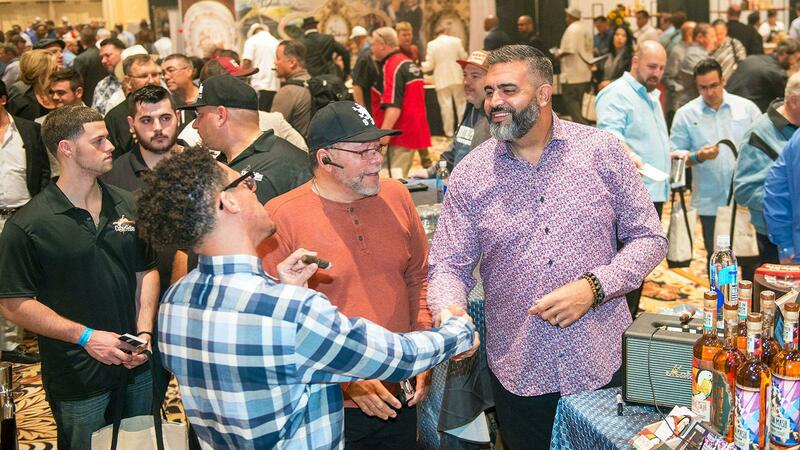 Now in its 22nd year, Cigar Aficionado’s Big Smoke Las Vegas spanned the course of two days and two nights, starting with a Friday night celebration full of food, spirits, camaraderie, and of course, cigars. Eager attendees marched into the Mirage Events Center to light up with friends and family, collect more than 35 cigars from their favorite companies and to snap photos with some of the biggest names in the cigar industry, including Pete Johnson of Tatuaje Cigars, Alan Rubin of Alec Bradley Cigars and Rocky Patel of Rocky Patel Premium Cigars. 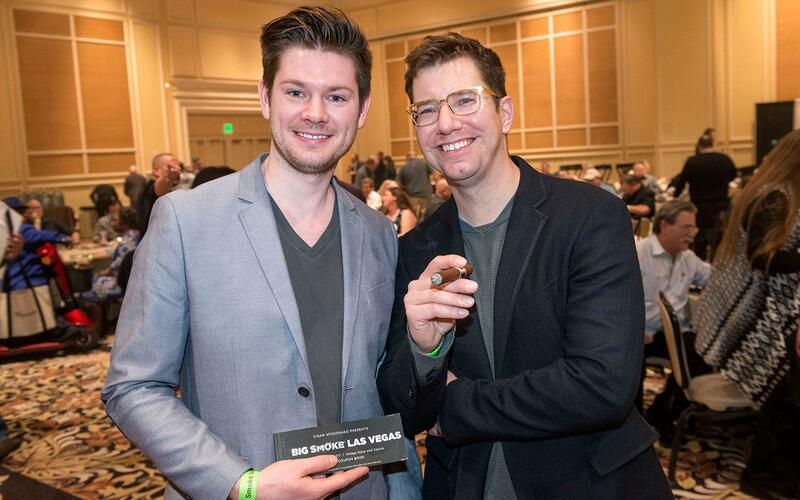 It's not uncommon to see fathers and sons smoking cigars and enjoying fine drinks together at the Big Smoke Las Vegas. There are brothers too, old friends, cousins, all coming together in the middle of the desert to enjoy a cigar with like-minded individuals. The Big Smoke is the kind of event that brings people together. Ari Maharis sits with his brothers Alex, George and John at a table on the showroom floor. The four men are smiling, joking around together, sorting cigars they've collected from the vendors at the Big Smoke. Ari, who is from New York City, has been making the pilgrimage to Sin City each year since the 1990s, a Big Smoke veteran. This is the first year he’s come with his brothers. Adam Crosson and Jordan Velestuk are all smiles as they collect their cigars at the Saturday evening event. This year, there were 37 premium cigars given out from the vendors stationed around the showroom floor. The companies passing out cigars were A.J. Fernandez, Arturo Fuente, Aging Room, Alec Bradley, Ashton Distributors Inc., Altadis U.S.A, Bombay Tobak, Casa Fernandez, Drew Estate, El Artista, E.P. Carrillo, Espinosa Cigars, General Cigar, Illusione, J.C. Newman, Joya de Nicaragua, La Aurora, La Galera, La Flor Dominicana, La Palina, Micallef Cigars, My Father Cigars, Oliva Cigar Co., Oscar Valladares, Padrón, Plasencia, Rocky Patel, Studio Tobac, Tatuaje, Ventura and Zander-Greg. As guests walked the showroom, smoking, collecting cigars and making new friends, they could also indulge in a variety of premium spirits, beers and cocktails from a bevy of brands. There were bars, complete with mixologists from Bacardi and Dewars and drinks stations pouring Oban, Lagavulin, Hennessy, Bird Dog Whiskey, Calumet Bourbon, Stolichnaya, Stranahan’s, Tincup, D’Usse, Loch Lomond, Glen Scotia, Westland Single Malt as well as a variety of cold Guinness. 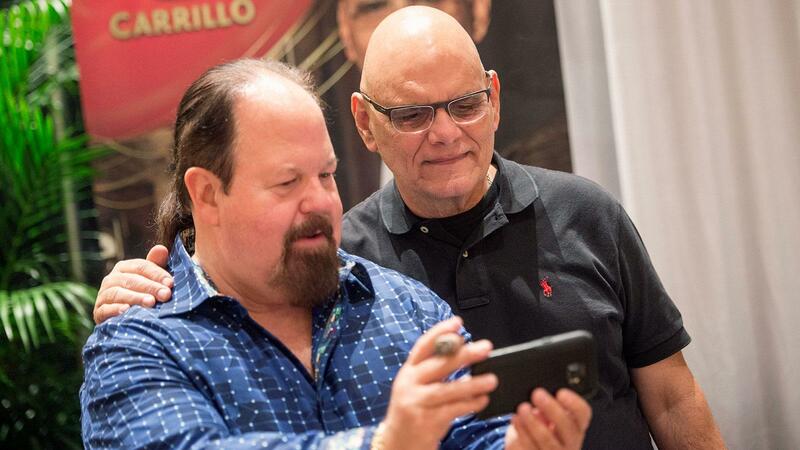 Ernesto Perez-Carrillo of EPC Cigar Co. takes a photo with Larry Burdette. When cigar smokers grew hungry, they needed only to turn their head to find delicious food options at various tables and booths provided by The Mirage's kitchen and catering services as well as fine dining restaurants such as Texas de Brazil, Lavo and Delmonico Steakhouse. There were also booths for humidification experts Boveda, air purification device manufacturers Rabbit Air, Dominican cigar consortium ProCigar and cigar rights activist Cigar Rights of America. Finally, as the showpiece of the floor, a sleek new Karma Revero (a luxury hybrid automobile), crouched like a predatory animal in the middle of the room, surrounded at all times by swarms of ogling cigar smokers. 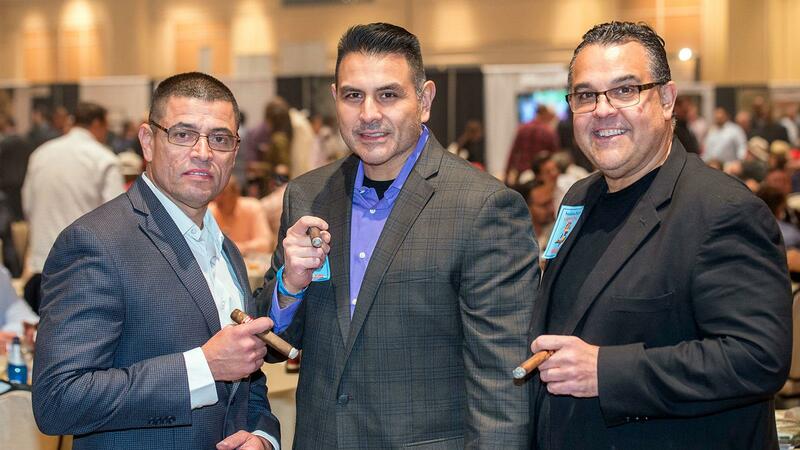 Chicago police officers Ralph Lopez, Art Torres and Eddie Pacheco enjoying fine smokes.